Superlatives these days, like cliches, are a dime a dozen. Everything is AMAZING!! AWESOME!! ASTONISHING!! ASTOUNDING!! (and that’s only the A’s). So what are we to do if we actually offer something that deserves exclamation marks? 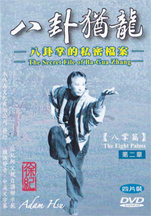 Adam Hsu’s Secrets of Bagua Zhang, Volume #3, is just such a product. This 4 disk set, comprising over seven hours of instruction, is an entrance to the temple that you never expected. It is like going behind the scenes to see how the magic is really made, how the end result came about, step-by-step. Using the Eight Changing Palms (which he teaches in depth) as his base, he takes the student through hours of practice—on the Bagua poles, in partner training, in applications, in discussions of principles—all the while circling back to the core palms (it IS Bagua, after all). He even opens the series with instructions in the 8 Animals Form. This is truly unique among DVDs; we’ve said it before about this larger series that Hsu Sifu is developing, but the closest equivalent to these courses would be to spend years with a traditional teacher. Hsu’s confidence is evident: he truly believes that a student who applies herself or himself will be able to learn and even master Bagua Zhang. For a more in-depth look, and to purchase this new set, click here. Posted August 13, 2017 by Plum Staff. Comments and trackbacks are open. Follow the comments feed. Tagged with: Adam Hsu, Bagua, Bagua applications, bagua partner training, bagua poles, bagua zhang eight animals, Baguazhang, Dong Hai Chuan, Eight Palm Changes, hus ji, Liu Yun Chiao, old mother palms, pakua chang, pkua, Yin Fu Bagua.